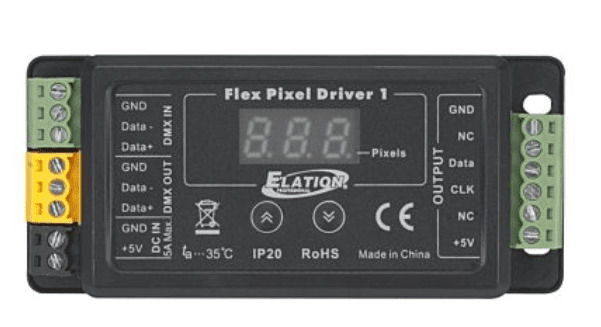 The FLEX PIXEL DRIVER™ 1 is a professional dedicated 5VDC LED tape driver that supports up to 144 pixels, and up to 432 DMX channels of control. Its small compact design allows for easy mounting and integration into any system. 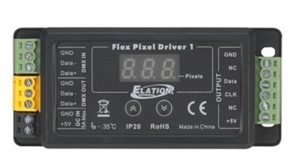 It features a 2-button LED control display, separate 3pin terminal blocks for DMX IN and OUT, a 6pin terminal block for LED tape output, and a 2pin terminal block for 5VDC power IN.